This is your chance to have one shot at Australia's newest V8 Supercar circuit using ORSM's V8Factor at TeamOz with the winner taking home a cool $100 cash. 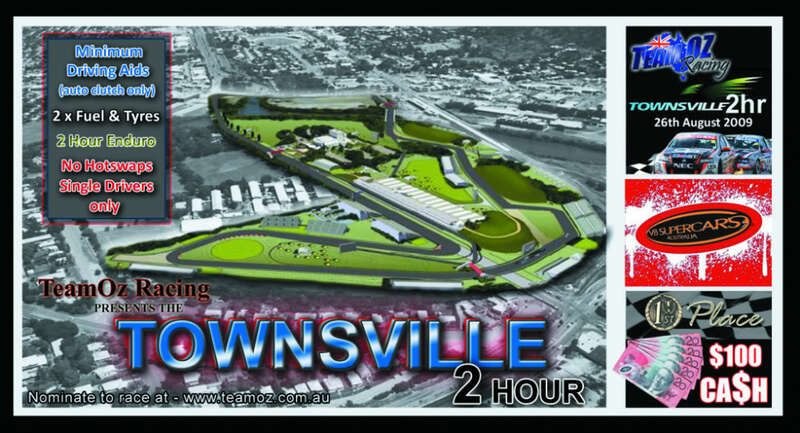 On Wednesday August 26th, TeamOz will be opening the gates of the Townsville (QLD) circuit for a single 2 hour Enduro. Entrants will need nerves of steel to compete in this event as it is set to be 99% "Driving Aid FREE" with just Auto Clutch being allowed. being accelerated by two. Only single drivers need nominate as Hotswaps will not be used. sounds cool stiky we need a few of us to get in some pactisce on 1 of the servers for a coupal of nights , what do u think? Too bad it is a Wednesday night I would of loved to have had a crack at this !!! Weekends just dont work for me and a few other ppl. There will be a praccy server up when the event gets closer. No worries Ando....Maybe next time. Woohoo ... auto clutch only , good to see , should be more of it . mrleisure1 wrote: Woohoo ... auto clutch only , good to see , should be more of it . Yeah Im with you Mrleisure..I was going to make it 100% no aids at all but some ppl dont have clutch pedals so decided on the Auto Clutch only. TeamOz never uses Traction Control in any event. We like it as close to the real Deal as possible. JFF server 1 hasnt got any races scheduled for a while so its been set up for some Townsville praci if anyone would like to use it. Just wanted you thank you guys for your support & let you know that OZAndo is the guy thank for coming up with this exciting 2 hour enduro with NO DRIVING AIDS. WHAT A CHALLENGE!! I will be doing practice for this event tonight if anyone wants to join me. JFF server. This wednesday 26th August the TeamOz Townsville challenge kicks off. Try and be in the server no later then 7:30.
this was an awesome event, 2hrs of intense concentration (i'm completely knackered) and one of my most enjoyable nights since i started rfactor, and some of the best driving i've witnessed, from everyone on the track, everyone who competed is to be commended and a big thanks to TeamOz and Ando for allowing us to compete. this has got me thinking and wanting more enduros without aids, its the best fun i've had with sim racing. thx again TeamOz and Ando. Yep, congrats Skip, Sticky and Ando, well driven. Awesome race and event, very well run by the folks over at TeamOz. Had a few near misses during the 2 hours, Ran out of fuel pulling into my pit bay, had to restart the engine while filling up, No time lost at least. Came around a bend to see 3 cars buried in the wall, one on the inside, one on the other side then the 3rd one nearly blocking the way thru. Hit the skids and turned the jocks brown and managed to squeeze thru. Also for most of the race i didnt seem to like the advertising down after the chicane, XXXX Beer or something. Im pretty sure by race end there was sirromet wines painted on the concrete wall. Couldnt remember how many times i hit that wall. I had lost interest in V8s for a while, these longer events have really got me back interested again. Really looking forward to our series starting on monday. Yeah mate, what a great night. You done exceptionally well sticky considering your turn 1 dramas and then fighting back to take home 2nd place. Great driving mate. Thx to all the JFF fellas for turning up and supporting this event. Im sure there will be more to come, oh and there has been a request for maybe Homebush:) Another street circuit,another challenge:) Lets see what happens. I have a wedding to go to this weekend and will have no time for any praccy at round 1 of the JFF enduro series:( But hopefully i will still be able to make it. What a test of keeping it all together. Like PhilPiggott my shoulders and neck was rooted at race end. My eyes went blury 15 mins from the end. I tried to talk to others to wake myself up but I couldn't even understand what I was dribbling about. Anyhow got better in last 5 minutes but tyres were gone. Congrats to Sticky for being on the 2nd tier and to PhilPiggott for finishing 11th. I qualified 25th and wanted to finish in the top 15 to be satisfied. Finishing 12th was great and I was wrapped with that result and I was off the pace by a couple of seconds a lap at least. Having Scotty as observer for the full 2 hours was great but I would have rather seen him on track but slightly behind me! As usual TeamOz did a faultless job and its good see the pats on the back given to them. Ando's wallet is now $100 lighter also.